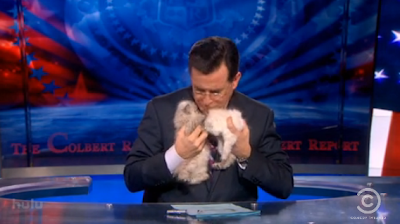 Stephen Colbert is no stranger to having cats on the set of his satirical Comedy Central show, and delighted audience members last night with a glimpse of two of his fluffiest guests yet. The host aired House Minority Leader Nancy Pelosi's anti-PAC spoof ad, before responding to her allegation that he doesn't like kittens. Pelosi's spot also admonished Colbert's practice of secretly collecting money from special interest groups for the Colbert Super PAC, and directed viewers to the Stop Colbert Facebook page, which in truth is dedicated to the 2012 Disclose Act - aimed at getting unlimited, secret donations out of politics. "What stings is Pelosi's charge that I dont like kittens - would someone who didn't like kittens have one in each hand?" he questioned, before revealing the two tiny balls of fur hidden under his desk. After giving the two a quick kiss and cuddle, he continued, "These are no mere props purchased right before the show. These are my beloved pets, Whiskers and.. Other Whiskers. I love these two little kittens and I will continue to do so until the moment they become cats." What happens when they become cats?